Daniel Ellsberg, a former military analyst who leaked the Pentagon Papers in 1971, called for increased resistance to nuclear war at an event at the Elliott School of International Affairs Monday. A former U.S. military analyst who infamously leaked the Pentagon Papers to the press in 1971 called for greater public resistance to the threat of nuclear war at an event at the Elliott School of International Affairs Monday. 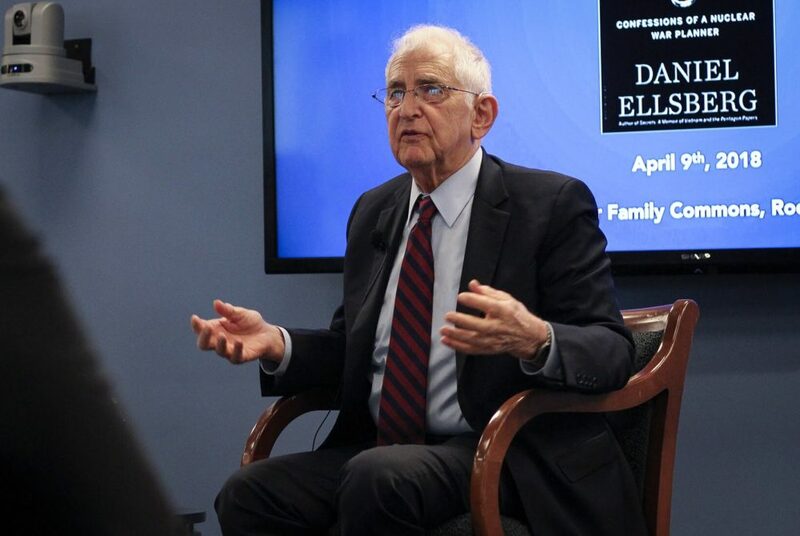 Daniel Ellsberg, a former nuclear war planner at the RAND Corporation, a global policy think tank, discussed his new book, “The Doomsday Machine,” at the event, which was sponsored by the Elliott School’s Ethics and Practice Initiative. The book discusses the ethics of using nuclear weapons as a war tactic. Ellsberg said American policymakers considered a plan, which he referred to as a “doomsday machine,” during the Cold War that would have led to the deaths of 600 million people, or one-fifth of the world’s population, not including the deaths arising from Soviet retaliation. “We would have killed 100 million in Western Europe – our allies,” Ellsberg said. While at the RAND Corporation, Ellsberg leaked the Pentagon Papers, a top-secret study of U.S. decision-making during the Vietnam War, to The New York Times, sparking a national controversy. Ellsberg was then charged with espionage for the act, but the charges were eventually dropped because of illegal evidence gathering. Ellsberg said he chose to leak the Pentagon Papers in part because stopping the spread of Communism was not worth potentially 600 million deaths worldwide. Ellsberg likened the power of nuclear weapons to a “terrorist capability” because it gives the leaders of nuclear nations the ability to kill non-combatants. He said the morality behind giving presidents around the world the power to end most forms of life on Earth was questionable at best. “In what framework of ethics should that choice be available to humans?” he asked the audience. He added that since the leaking of the Pentagon Papers more than 40 years ago, public discussion about the value of nuclear weapons has been negligible. He pointed to North Korean Dictator Kim Jong-un’s nuclear weapons proliferation in North Korea as an example of the continuing struggle for disarmament. “Nothing has significantly changed. I don’t hear the debate yet,” he said. Rather than express remorse over leaking classified government documents, Ellsberg said he regretted not leaking the papers sooner.